Liverpool arrived in Seville seeking to banish the memories of their Europa League final defeat. Instead, they relived much of that nightmare. A first half of comfort was immediately transformed into a second of defensive calamity. The similarity was harrowing. In Basel in 2016 Sevilla overturned a one-goal lead. Here, Liverpool were three up at half-time, seemingly strolling, only to surrender superiority leaving Spain with a point. The equaliser in the third minute of injury-time from Guido Pizarro sparked such celebrations as to suggest a trophy would be presented at the end. Liverpool's players looked as forlorn was when they lost that final. They were seconds from qualifying for the last 16 but must now complete the job in their final group game. As in Switzerland, they left their brains in the dressing-room at the interval. There was much to reassure about the brilliance of Liverpool's attacking, but concern about how brittle they are under pressure. 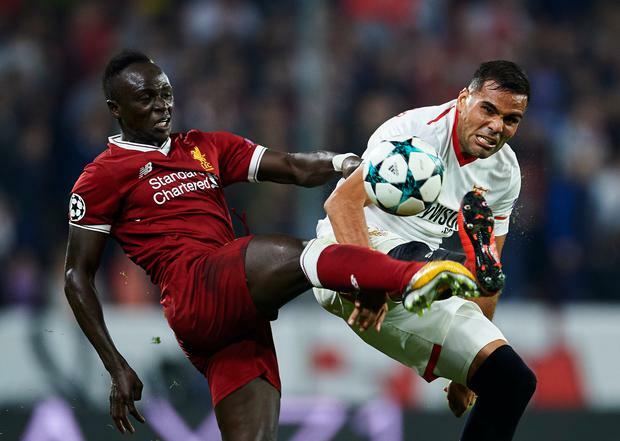 Roberto Firmino's double and Sadio Mane had stunned the hosts, but within 15 minutes of the second half Wissam Ben Yedder had scored twice and Liverpool were holding on. They could not see it through. The defensive fortitude noted in recent weeks evaporated in a hectic spell. The poise the Liverpool manager had observed in the last four games gone. "This is real Champions League," Jurgen Klopp said ahead of the meeting with Sevilla. Not to disparage earlier group encounters, but you instantly feel the difference arriving at venues such as the Ramon Sanchez Pizjuan Stadium. There is an earthy substance to it, and even in the hours before kick-off the vibe casually edges toward intimidating. Liverpool have been playing well of late, but the two most difficult away games of this season - at Manchester City and Tottenham Hotspur - were defensive catastrophes. This is where Klopp would discover if a recent improvement was due to a maturing team or dwindling quality of Premier League opposition. There could be no dismissing of the standard with Liverpool performing well here. Sevilla are currently fifth in La Liga, formidable in their own stadium where only Juventus had emerged victorious in the last 25 games. So Klopp picked what could be perceived as his strongest line-up, aside perhaps from his persistence with Loris Karius on European duty. That call also looked to have paid off when the German keeper made a critical early save. For Philippe Coutinho there was a dual ambition. Assist his current club while impressing a potential future audience. There is no doubt the Brazilian will have been considering the implications of a star performance on Spanish soil, and even less debate as to whether Barcelona's scout were monitoring his impact. His influence was instant, his dead-ball skills stunning the home side as the visitors asserted their authority. Liverpool took the lead after just two minutes when the Brazilian's corner was headed to the backpost by Gini Wijnaldum, Firmino free to side-foot past Sergio Rico. They were two up 20 minutes later with a replica move, Firmino providing the headed assist for Mane on this occasion. Coutinho was again the supplier from a corner. Sevilla looked so clueless at defending set-plays one wondered if Tony Pulis might have been considering this his next port of call. Liverpool's second was needed because the hosts had belatedly started to gather momentum and should have equalised with two easy chances in the space of two minutes. Karius takes the credit for preventing the first on 18 minutes, former Manchester City striker Nolito denied. Faced one-on-one, the placed attempt was flicked on to the post, the rebound kindly falling into the goalkeeper's arms. A minute later Ben Yedder should have tested the goalkeeper but wastefully shot wide. 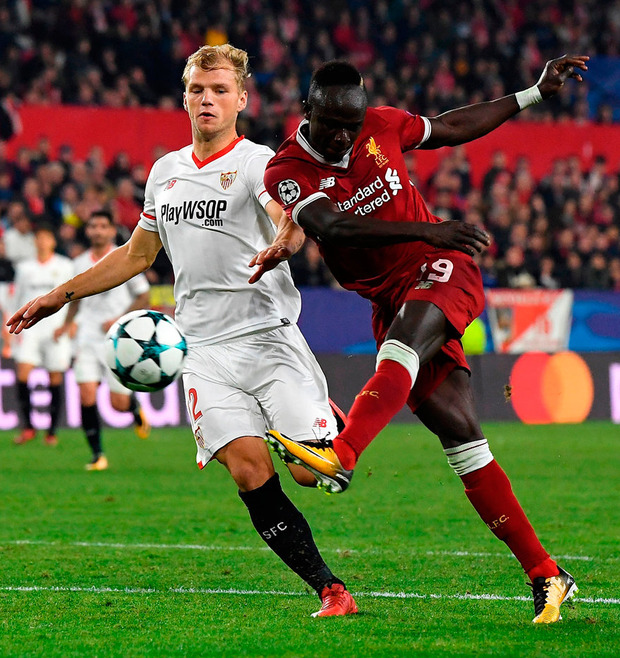 The game drifted away from Sevilla thereafter, Firmino wasting his own one-on-one, but when Alberto Moreno arranged a sprint between Mane and the Sevilla defence it was a mismatch. Mane was magnificent from the first whistle, his calm evident within 30 seconds, the raucous environment doing nothing to stop him appearing to have more time than everyone else. His class showed again on 30 minutes, gliding on to Moreno's perfect ball and shooting at the overworked Rico. The goalkeeper could only parry to Firmino for his second and Liverpool's third. The celebrations continued at the corner flag where Liverpool's supporters convened. Aside from the two opportunities for Sevilla, Liverpool had been as impressive without the ball as with it. There was little opportunity for the La Liga side to generate any passing momentum. 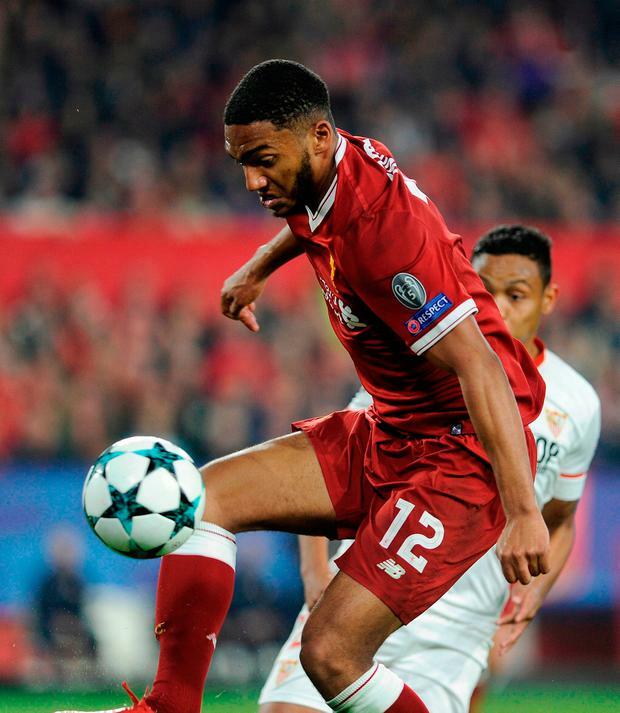 Everything that made them so eye-catching in previous meetings with Liverpool was absent, Klopp's midfield runners as adept at scurrying to retrieve the ball as exhaust their opponent with it. 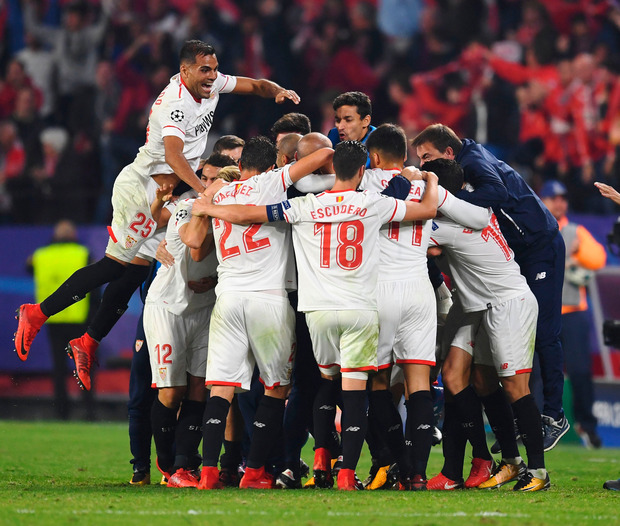 Several Sevilla players started to hobble around feeling an assortment of joints as half-time approached. Their coach Eduardo Berizzo must have been name-dropping Istanbul at half-time in a desperate attempt to salvage pride. Klopp will have ordered his side to offer no encouragement. His players evidently failed to listen. Six minutes into the second half Ever Benega's free-kick was met by Ben Yedder, the deficit was cut and belief was restored. Moreno, who had started the second half as he did in Basel 18 months ago, then conceded a 60th-minute penalty, which Ben Yedder converted twice - the referee penalising Sevilla for encroachment on the first attempt. Liverpool were now holding on, what looked a safe passage into the last 16 now turning into a toil. Klopp had to act, withdrawing Moreno and Coutinho for Emre Can and James Milner. This, allied to a formation change to 4-5-1, brought some respite.